Also available in White, Silver, Lilac, Mauve, Mint, Avocado OR Soft Gold! be used together. All wire, chain and findings are also Sterling Silver. 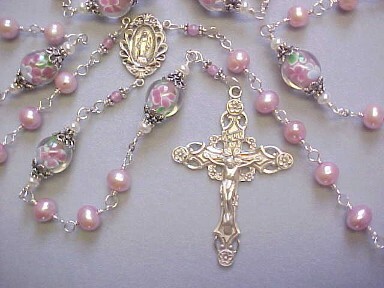 A larger size of this rosary is available with 7x8mm Peach, Ocean Blue, Bronze-Gold or White side drilled "potato" shape Fresh Water Pearls and matching floral glass. See #44 page 9 for pricing and details. 7x8mm Rose color freshwater cultured pearls and 11mm lampworked glass with a mauve core and multicolor flowers sealed under clear glass, capped in ornate sterling silver twisted wire caps and white button shaped freshwater pearls. 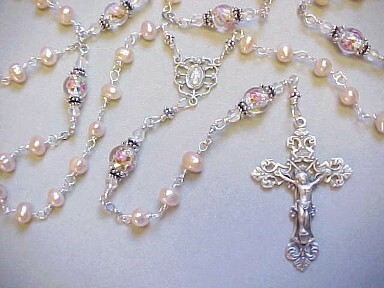 The Deluxe Floral Crucifix and Ribbon Edge Miraculous Center (NOTE: the crucfix and center shown have been discontinued. They are replaced by the set on #19, Designer Collection 4) are satin finished sterling silver with engraved highlights. All wire, chain and findings are also Sterling Silver. inside the bead frame as you rub your thumb on it. 8mm pale green Celery Jade (precious Serpentine) is complimented by8mm red Cloisonne with pink and green floral design, enclosed inside hand-made Sterling Silver 10x15mm bead frames for a very unique look and makes it very nice to pray with because as you rub your thumb over the Cloisonne, it spins inside the bead frame. The 2 1/4" Loops and Flowers Crucifix and 7/8" 3D Raised Image of Mary center are hand cast Sterling Silver reproductions of vintage rosary components, available only by special order and only as a matched set. All wire, chain and findings are also Sterling Silver. 8mm Faceted Cape Amethyst, a lovely lavender color, is combined with large rondelle Lampworked glass with a lavender tint and pink petal flowers inside the glass, capped in Bali silver and accented with fresh water Pearls and pink Quartz. 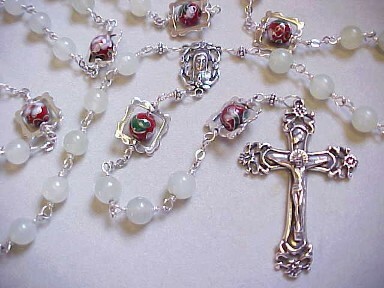 The 2 3/8" Deluxe Floral Crucifix and 1" Ribbon Edge Miraculous Medal (NOTE: the crucifix and center shown are discontinued. They are replaced by the set on Rosary #19, Designer Collection 4) are satin finished sterling silver with engraved highlights. All spacer beads and findings are also Sterling Silver. Lavender Amethyst is a recognized birthstone for June. 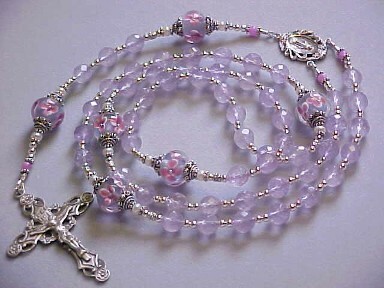 THIS ROSARY IS GORGEOUS - THE PHOTO DOESN'T DO IT JUSTICE! 5x7mm Turquoise tubes and Baltic Amber with Bali Silver caps tipped with red Coral. This rosary has a "southwest" look, very appealing to teenagers, and equally appropriate for a man or woman.The 1 3/4" Small Filigree center and 5/8" Small Filigree crucifix are sterling silver. All wire, chain and findings are also Sterling Silver. Turquoise is a recognized birthstone for December. *NOTE: Most turquoise is soft and porous when it is mined. Untreated Turquoise is a fragile stone with a tendency to develop undesirable color changes when it is exposed to light, perspiration, oils and detergent. It is penetrated with resin for durability. This serves to harden the stone and enhance its color, as well as help prevent the absorption of body oils and deterioration from chemicals. 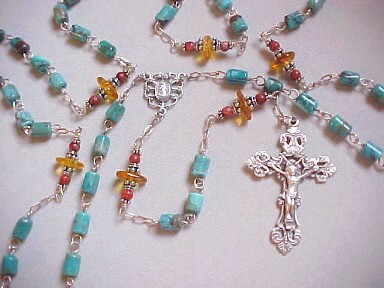 See a different Turquoise rosary on the next page.